Cloudoe, as a business has a long history in the deployment of customer telephone systems and contact centre solutions across the Netherlands, with a focus on understanding the needs of their business and reseller clients. When the opportunity came to purchase an existing BroadSoft, they took the opportunity with both hands, knowing the pedigree and dominance BroadWorks has in the Business Cloud marketspace. However, like many Service Providers have discovered, there was no management portal apart from the BroadSoft EWS. This made day to day management difficult, BroadSoft Licence Utilisation near impossible and plotting sales growth challenging. The original deployment of the BroadSoft resulted in a number of weaknesses. Cloudoe found that the packages created within BroadSoft were often duplicated or, in some cases, different packages had the same name or there were no defined packages at all. In total, there were over 100 packages in BroadSoft before the move to Uboss; on project completion there was less than 50. Alex Inkelaar, COO at Cloudoe explained “we needed to find a management platform that was designed to take on the challenge in the BroadSoft space but that ultimately let us extend past only delivering BroadSoft services and instead becoming a complete Cloud application provider”. Once we had decided that Uboss was the platform of choice the initial requirement was to correct the errors of the past and complete the migration of all existing services and users so we were set for the future without disrupting our existing reseller, users services and revenues. extensive call logging and service reporting at all levels, along with an integrated billing module (optional) which could manage and distribute invoices that are localised with reference to currency, tax and language. The Uboss team knew that from previous deployments, each platform owner (in each country) will have used BroadWorks in their own unique way. Step one was to verify and cleanse the data, standardise the propositions, optimise the BroadSoft licence consumption and identify any service enhancements, for example the introduction of Surge Mail to improve the voicemail proposition to customers . Cloudoe have a number of projects and business development programs on the go, so it was also extremely helpful that Uboss is offered as an OPEX or CAPEX Model. ‘For now, we have taken the OPEX option to leave our capital funds available for business development programs, but in time, we will have the flexibility to move to the CAPEX model, which was a facility that set Uboss apart’ Martien Verhoeven (CFO) from Cloudoe says. 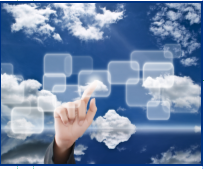 The Uboss and Cloudoe teams worked closely to identify, build, test and develop all the functionality needed for Cloudoe’s future programs and at the same time catering for the established positions. 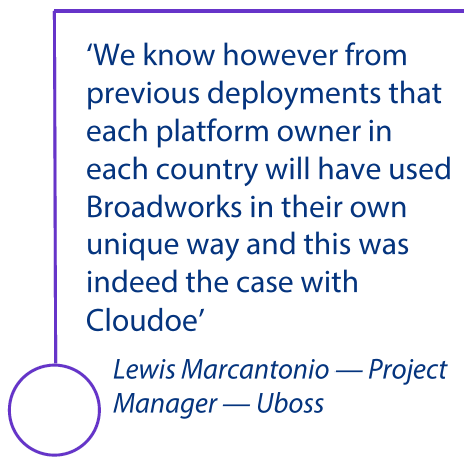 Migration tools were used to script the existing BroadWorks customers and services into Uboss in a three-phase project to ensure control and smooth delivery. 1st phase was the provisioning capabilities, 2nd phase was the platform user billing and finally the 3rd phase was the end customer billing. This meant that, at all times, Cloudoe could include their partners in the process without a major disturbance to their business. A major additional benefit, that was not realised at the original order point, was credit locking. Cloudoe, like many other service providers, experience attempts of dial- through fraud. The existing methods of managing this through the BroadSoft Call Barring feature and other back end processes and monitors were time consuming and not always 100% effective. The Credit Lock User service was implemented and, over the course of about 5 days, it was deployed across all users. Suddenly we had daily credit limits on all users, and SIP Trunks, with auto updates of users nearing their credit limit and automatic outbound barring of a user when daily limit exceeded regardless of what time or day it was. Cloudoe operates in a fast moving and competitive marketplace facing stiff competition from one of the biggest BroadSoft success stories. By deploying Uboss, Cloudoe have now opened up distribution options, enhanced their Broadworks feature set, allowed the integration of 3rd party products into the portfolio, and even the packages, but kept everything in one highly capable management ecosystem.